Why does Toronto have so many half built relics? With Toronto real estate commanding a premium, you’d think developers of condominiums or commercial buildings would have solid plans in place before putting a shovel in the ground, but this isn’t always the case. Interestingly enough, many condo developments in downtown Toronto begin their sales process without ever having all their approvals in place and just a “sketched out idea” of what they are hoping to sell as opposed to what they are actually going to be allowed to build. Often times, there will be a change to the exterior design, interior spaces and even the height of a building before the condo is completed. At the extreme end of development in Toronto’s city centre are familiar examples of some grand proposals that were never built (ferris wheel notwithstanding) but you may not be as familiar with some projects that were started and then just abandoned for one reason or another. Again thanks to our friends at SpacingToronto, below is a link to a piece which discusses a handful of projects where construction began but never finished. One of the most fascinating is the Hampton Park Apartments. I remember the odd time as a kid driving with my Dad down to his office on King Street East and we’d travel down the Bayview extension. Of course, we’d always pass that empty shell of a building up on a hill and I used to call it the Ghost Building. 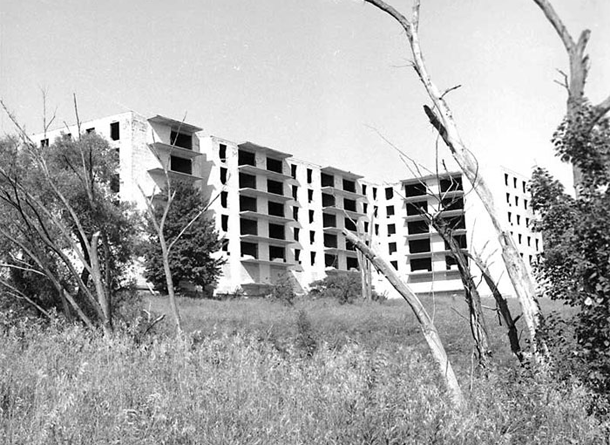 “Unable to block the construction itself, the city refused to extend water and sewer service to the site.” Construction stopped and the empty shell of the apartments sat there for over 20 years. It was demolished in 1981 and replaced by a controversial subdivision of homes in Governor’s Bridge Estates. It was controversial at the time because the developer was charging Rosedale prices for homes that backed onto a busy Bayview Avenue which of course now seems like it’s of little consequence at all considering how heated out market is. Among the other projects discussed are the Eaton’s flagship store at Yonge and College (practically cancelled twice! ), the Victory Building at 80 Richmond Street West (which is still standing) and the elevator shaft that was started for the Bay-Adelaide Centre (the ‘stump’) which sat for more than ten years before it was demolished. Not every one is a winner! Luckily, most residential condominium developments that get started in the city are completed, but there are many examples of where there are multiple delays. Even in today’s market place you have to be careful when choosing new construction and the key is to make sure you’re choosing a reputable developer; this of course is where a Realtor comes in handy. Not only should you have a Realtor to assist you with the ins and outs of negotiating extras when signing on the dotted line but also to ensure you understand the risks associated with buying into a development that isn’t more than just some developer’s idea of a good investment. If you’re thinking of buying a new condominium in Toronto and you have questions about the best way to attack the market, I’d be happy to discuss the pros and cons and the questions you need to ask when entering a sales centre. Remember, the sales people at the sales centre work for the developer, not you… that’s where I come in! If you know of any other half-built structures in Toronto, please let me know!